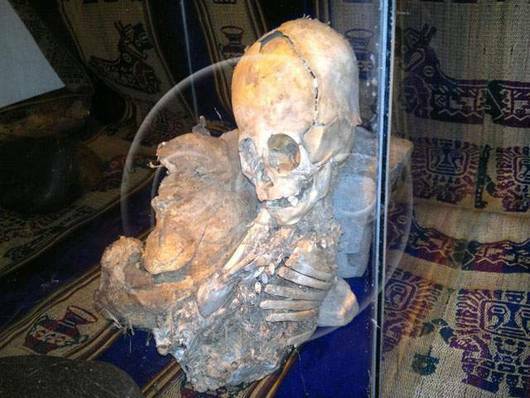 "Peruvian anthropologist Renato Davila Riquelme has discovered what appear to be the mummified remains of an alien-like creature, including a "triangle shaped" skull nearly as big as its 20-inch-long body. Riquelme himself posits that the remains are those of a child. Peruvian news site RPP however, has interviewed several (conveniently anonymous) Spanish and Russian scientists who claim the remains are actual those of an extraterrestrial, supported by the clearly "alien" skull. 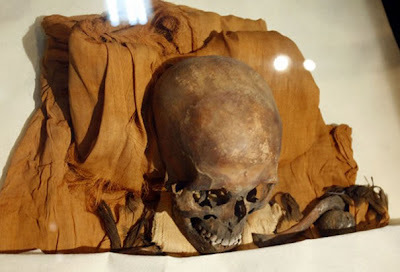 "The reasoning behind the anonymous scientists' claims, which are not backed by either Riquelme or his anthropological team at the Privado Ritos Andino museum in Cusco, Peru, centers on the alien-like formation of the skull. "An alternative explanation for the bizarre discovery is that the skull was artificially deformed as part of a tribal ritual. The practice of skull elongation - to signify group affiliation or social status - dates back 9,000 years. Common in various tribal cultures around the world (such as Mayans, North American natives and Australian Aborigines), the head moulding styles fell into three groups: flat, round or conical. "To achieve the desired shape, the head was wrapped in tight cloth. In the case of cranial flattening, the head was placed between two pieces of wood. 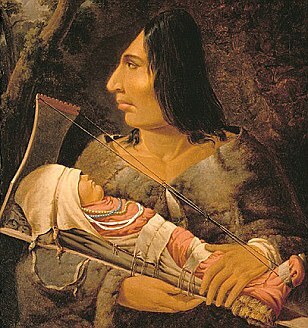 The technique would usually be carried out on an infant, when the skull is at its most pliable. The cloth would be applied from a month after birth and be held in place for about six months." OK, but I remembered something about the famous heretical Egyptian Pharaoh Akhenaten and his entire family, that they had elongated heads and large eye sockets and looked much like the little Peruvian skeleton's skull. "As for the shape of Akhenaten's head, Yale University School of Medicine's Irwin M. Braverman, M.D. attributes this to a condition called craniosynostosis, in which sutures, the fibrous joints of the head, fuse at an early age, and interfere with the process of skull formation. The specific condition, called a sagittal suture, is dominantly inherited. Dr. Braverman says he observed this abnormality in the king's daughters as well as in Queen Hatshepsut, daughter of Tuthmosis I, founder of Akhenaten's paternal line, and in King Tut, who ended this line. "Sutures normally expand as the brain expands and typically do not fuse until the age of 25 to 30. "At first, I wondered whether they bound the heads of infants to get this effect," says Dr. Braverman, "but there is no mention of this in Egyptian literature." ~from the University of Maryland School of Medicine. I'm always skeptical when everything unusual is credited to space aliens. "The weekend made sweet love to me for days until I fell asleep in his arms last night, then he slipped away in the wee hours and I woke to find him gone :-( "
Oscar Wilde’s famous tomb in Paris will now be getting a lot less love. Devoted fans of the “The Importance of Being Earnest” author have long journeyed to his tomb in the city’s famed Pere Lachaise Cemetery to plant a lipstick smooch on the tombstone, but not anymore. On the 111th anniversary of Wilde’s death, the cemetery is unveiling a cleaned up monument with a glass barrier around it to prevent tourists from kissing the stone. Cemetery officials determined that the grease from the kisses was damaging and eroding the stone, according to the U.K.'s Guardian newspaper. "Wilde was buried there in 1900, but it wasn’t until the 1990's that literary buffs began kissing the monument. Authorities imposed a fine of $12,000 for kissing or writing on the tomb, but it proved very difficult to enforce. "The famed cemetery was established in 1804 and is one of the most visited in the world, according to a U.S. website dedicated to the cemetery, created by the authors of the book “Meet Me at Pere Lachaise.” It is 118 acres and houses over 70,000 monuments. 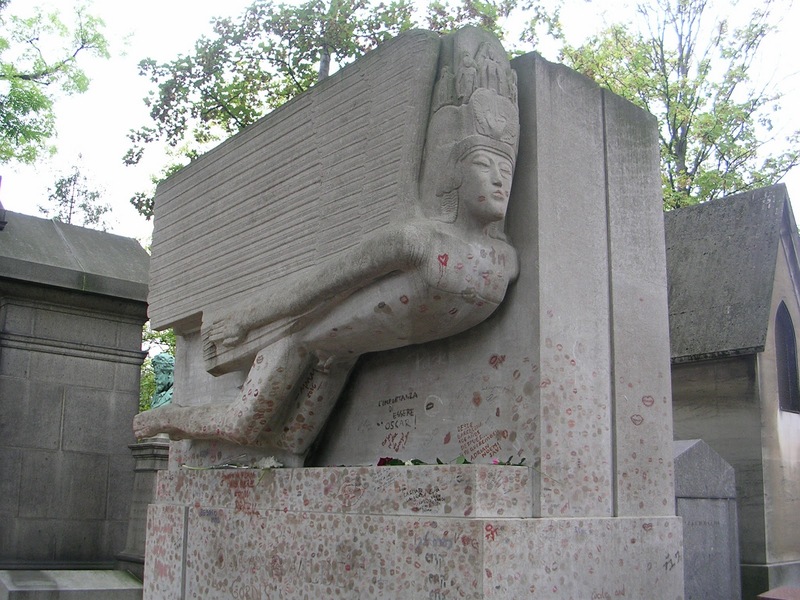 Other notable people buried there include singer Edith Piaf, painter and sculptor Amedeo Modigliani, writer Marcel Proust, dramatist Moliere and musician Jim Morrison." To which I will add Marie du Plessis, the famed Lady of the Camellias, and her most famous interpreter on the spoken stage, Sarah Bernhardt, as well as Chopin and a huge host of other greats in the arts and letters. At least the Messiah had undergarments on. Although Jesus in a harness is kinda... not right. That video made my morning cuppa, Will, especially so when his frantic attempt to cover up increased the spin rate! It's news to me that kisses are planted on Oscar's tomb - when did that start? But what a shame to glass-case it. Because he may be my favorite sculptor, may I be permitted the tiniest bit of disappointment that you didn't identify Jacob Epstein, the artist responsible for this much kissed piece. Best known (probably) for the Oscar Wilde tomb, he is also widely recognized for 'St Michael's Victory over the Devil' sculpture on the new Coventry Cathedral.